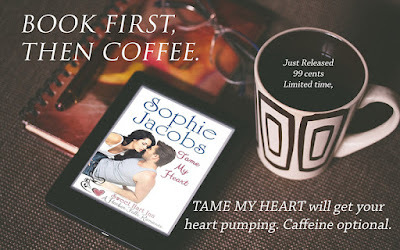 The Un-Official Blog of Romance Author Maddie James: Tame My Heart by Sophie Jacobs - Releases Today! What’s a small town cop to do when the love of his life runs away when he pops the question? Katie Long is not about to be saddled with commitment. She has dreams, plans, and she’s working hard to fulfill them. Her relationship with local Harbor Falls police officer Chris Marks is fine just the way it is. Why does he think they need to change it up? She knows why. She just doesn’t want to deal with reality. But when Chris pops the question, reality hits her square in the face and she panics. After Chris exhausts all hope of reasoning with Katie, he hires Suzie Hart to set him up with a romantic dinner for two, hoping she will work some of her matchmaking magic. Suzie does all she can to set the mood but Katie isn’t about to be wooed. Then Suzie learns something about Katie and supplies Chris with a couple of items that might tame her wild heart, after all.